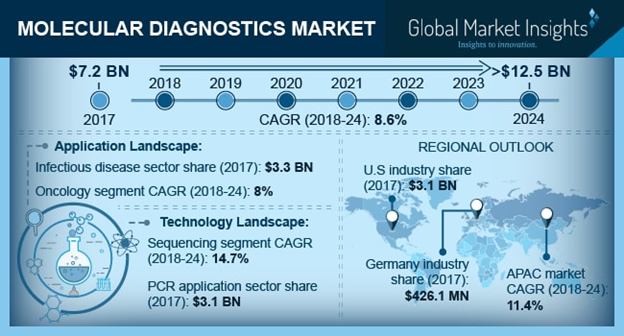 Molecular Diagnostics Market size is set to exceed USD 12.5 billion by 2024; according to a new research report by Global Market Insights. Infectious and genetic diseases are one of the key causes of mortality across the globe. Early and accurate detection of these diseases allows better management while late diagnosis makes treatment difficult. Conventional diagnostic techniques fall short in terms of accuracy and rapid turnaround time required for diagnosis at early stage. It has created intense need for superior diagnostic methods. Increasing incidences of infectious and genetic diseases and associated mortality rates are predicted to catalyze the adoption of molecular techniques for early diagnosis and better management of infectious diseases. Complex nature of the regulations and excessive cost of advanced molecular techniques are expected to hinder the industry growth to some extent.